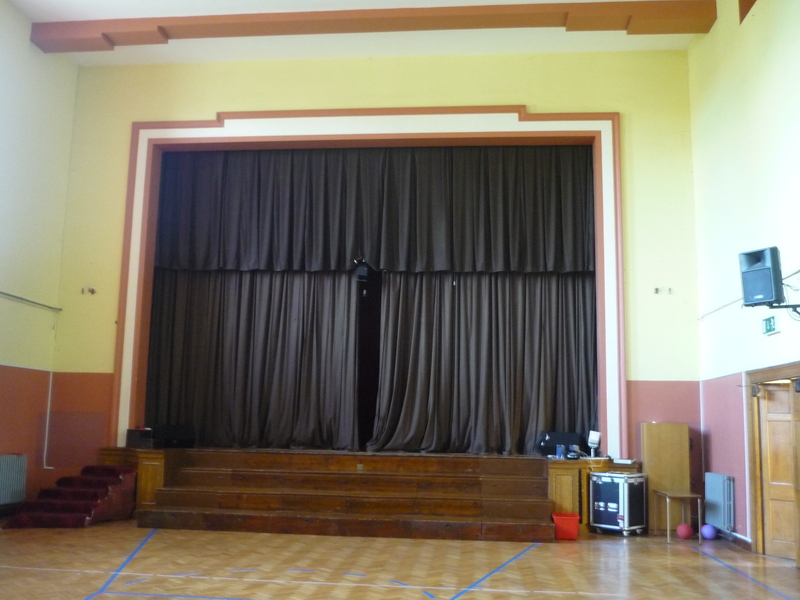 This is the very first stage I ever performed on…I was five years old and playing the Triangle at the Christmas School Concert. I took this photograph today. Let me tell you how it all came about. I received a very nice email from Ms Foran who is a teacher with the Junior Infants in Saint Catherine’s School in Cabra West. It was an invitation to give a presentation to the Junior Infants (6 year olds) on growing up in Cabra West. Ms Foran sometimes uses the Cabra History.Com website as a teaching tool when speaking to her young students about where they come from. So this morning I was up bright and early, washed and polished and hair combed by half past eight. I didn’t want to be late for school in case I got the dreaded strap. Then I realised that my appointment was for 11 o’clock, I was way too early. I was all anxious and nervous as if I was starting school all over again. ‘Ma’ where are you when I need you’? I tried to prepare as best I could but I was nervous in case I’d let the children down. And of course every traffic light was against me. The clock was ticking away which had my heart thumping with every tick tock. ‘Holy God, please don’t let me be late’. Before leaving the house I had checked and double checked that I had all my bits and pieces with me. And then panic started to set in as I thought I had the wrong day. Then I drove in through the gates of the school. ‘This is it Martin, there’s no turning back now’. As I stood beside my car in the Boy’s Playground I looked around and in my mind’s eye I could see at least a hundred young boys running and chasing each other around me. There was Sister Mary Oliver on yard duty with a group of children trailing behind her. Then I found myself standing face to face with the large wooden doors of the Junior Infants School. I nervously pressed one of the two doorbells on my right and suddenly the doors magically opened all by themselves. It was like what you’d see in a creepy film on the Cabra Picture House. As I walked in through the doors I half expected to be greeted by a nun dressed in her habit of black and cream but instead I was met by several smiling and cheerful young children. That lifted me up no end. After getting some friendly advice and directions I ended up in the school office and in next to no time I was shown to the classroom of Miss Foran. Well now, when I looked into the classroom and saw all those happy young student full of life all of my fears and anxieties went straight out the window. The classroom was lovely and bright with plenty of nice cheerful colours all around the room. After a few minutes some more young children as well as their teachers joined us. When everyone was settled in we started off with questions and answers. Well they certainly came prepared with lots of very interesting questions…‘Did you ever get slapped in school?…’What food did you eat when you were small?…Who was your favourite teacher?…’ Well I can tell you that those young children certainly kept me on my toes with all their question. I also told them some stories about growing up in Cabra West and about my seven brothers and seven sisters. They loved the story of the dead horse floating in the Cabra Baths.